The prediction of ancestral protein sequences from multiple sequence alignments is useful for many bioinformatics analyses. Predicting ancestral sequences is not a simple procedure and relies on accurate alignments and phylogenies. Several algorithms exist based on Maximum Parsimony or Maximum Likelihood methods but many current implementations are unable to process residues with gaps, which may represent insertion/deletion (indel) events or sequence fragments. Here we present a new algorithm, GASP (Gapped Ancestral Sequence Prediction), for predicting ancestral sequences from phylogenetic trees and the corresponding multiple sequence alignments. Alignments may be of any size and contain gaps. GASP first assigns the positions of gaps in the phylogeny before using a likelihood-based approach centred on amino acid substitution matrices to assign ancestral amino acids. 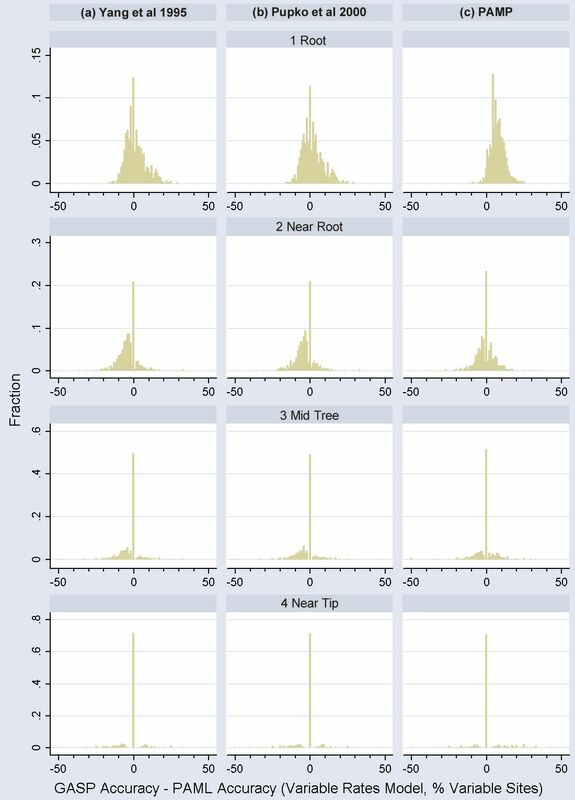 Important outgroup information is used by first working down from the tips of the tree to the root, using descendant data only to assign probabilities, and then working back up from the root to the tips using descendant and outgroup data to make predictions. GASP was tested on a number of simulated datasets based on real phylogenies. Prediction accuracy for ungapped data was similar to three alternative algorithms tested, with GASP performing better in some cases and worse in others. Adding simple insertions and deletions to the simulated data did not have a detrimental effect on GASP accuracy. GASP (Gapped Ancestral Sequence Prediction) will predict ancestral sequences from multiple protein alignments of any size. Although not as accurate in all cases as some of the more sophisticated maximum likelihood approaches, it can process a wide range of input phylogenies and will predict ancestral sequences for gapped and ungapped residues alike. Predicting ancestral protein sequences from a multiple sequence alignment is a useful tool in bioinformatics . Many evolutionary sequence analyses require such predictions in order to map substitutions to a particular lineage (e.g. [2, 3]). In other situations, the predicted ancestral sequence alone may provide a more representative functional sequence than a simple consensus sequence constructed from an alignment. Nevertheless, predicting ancestral sequences is not a simple procedure. It relies on a quality alignment plus an accurate – and correctly rooted – phylogenetic tree. Strict consensus methods are quick but can suffer from over-representation of larger clades of related sequences, which contribute more sequences to the consensus than more sparsely populated clades. Maximum Parsimony (MP) methods  overcome this problem by minimising mutational steps, rather than maximising agreement with the terminal sequences. MP, however, cannot distinguish between several equally parsimonious predictions. More sophisticated likelihood-based methods exist that can give probabilities for different ancestral sequences (e.g. [5–8]) and implementation such as CODEML  and FASTML  provide a good balance between speed and accuracy. However, many of these programs cannot predict ancestral sequences for columns of the alignment that have one or more gapped residues . GASP (Gapped Ancestral Sequence Prediction) is an ancestral sequence prediction algorithm that is designed to handle gapped alignments of any size using a combination of MP and likelihood methods. Although probably not as accurate as some of the more sophisticated maximum likelihood approaches, it permits the estimation of ancestral states at residues that are gapped in any sequences of the alignment with comparable accuracy to that of ungapped residues. GASP uses input from three sources: a multiple sequence alignment (MSA); an accompanying phylogenetic tree in Newick format ; and a Point Altered Mutation (PAM) substitution probability matrix, such as that of Jones et al. 1992 . Sequences are read in from the alignment and node relationships established from the tree. The tree may be already rooted or rooted using GASP and must have branch lengths. Bootstrap values are not used by GASP but will be read if present. Sequences in the tree file can be represented by numbers (matching the order of the fasta alignment) or the first word of the sequence name. Details of the input formats can be found at: http://bioinformatics.rcsi.ie/~redwards/gasp/. Sample output from GASP. (a) The first 100 columns of a typical GASP ancestral sequence prediction output. Sequence order matches the default vertical ordering in the tree files produced by GASP. (b) A rooted version of the input tree. Lengths of branches are those defined in the input file. (c) A new version of the input tree with nodes labelled and branch lengths recalculated based on ancestral sequence prediction. Note. 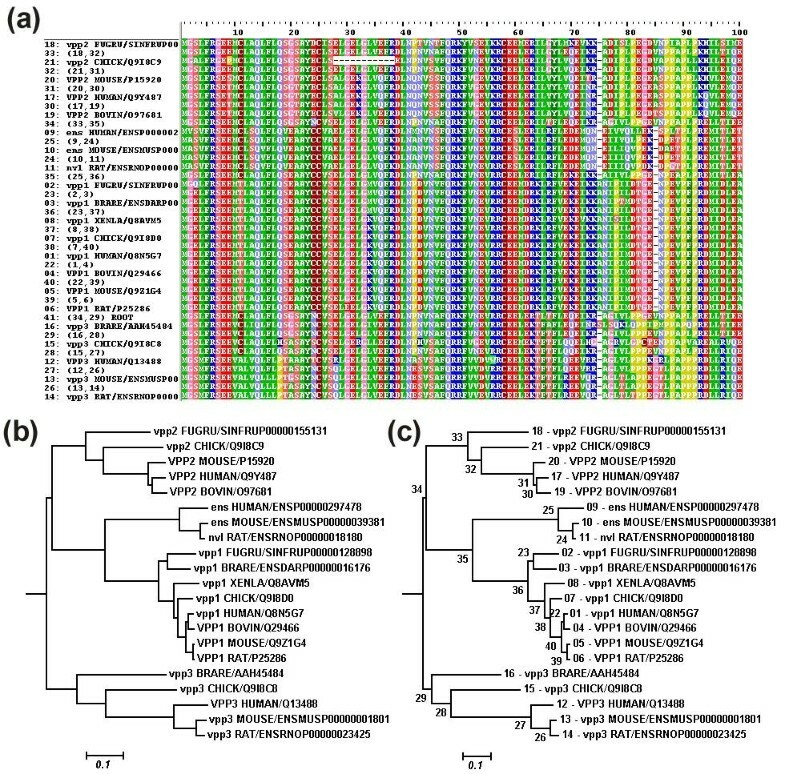 Data is output in (a) fasta format and (b & c) Newick format but for visual clarity the file has been shown using (a) BioEdit  and (b & c) TreeExporer . where p X is the likelihood for a PAM distance of X (see 'Ancestral sequences' below), i is the ancestral amino acid at position r,j is the descendant amino acid at position r, p ijX is the substitution probability of i to j in a PAMX matrix, and N is the number of residues in the alignment. Substitutions involving gaps are ignored in this calculation. This allows a visual comparison between the branch lengths of the input phylogeny and the predicted branch lengths given the ancestral sequence predictions. where p is the gap probability for residue r at node n. p1 and p2 are the gap probabilities for r at the two descendant nodes. where p0 is the gap probability for r at the ancestral node. As with the root, r is fixed as a gap if p ≥ 0.5. This continues until all nodes are assigned as 'gap' or 'non-gap'. where i is the ancestral amino acid,j is the descendant amino acid, k is the 20 possible transitory amino acids, p ijX is the substitution probability of i to j in a PAMX matrix, pik(X-1)is the substitution probability of i to k in a PAM(X-1) matrix and pkj 1is the substitution probability of j to k in a PAM1 matrix. where p i is the probability of amino acid i at residue r of node n, pijX 1and pijX 2are the probabilities of substitution from amino acid i to each amino acid j in the appropriate PAM matrix for the two descendant branches, pdj 1and pdj 2are the probabilities of amino acid j being at position r at the two descendant nodes. Once the root is reached, the most probable amino acid is fixed as the ancestral sequence. As with gaps, GASP then works back up the tree, using the fixed ancestral node amino acid and the descendant node probabilities to give new probabilities for each amino acid. The most probable amino acid is then fixed and the process continues until all residues and all nodes have a fixed sequence. GASP is primarily designed for reasonably small trees (6–30 sequences), although there is no limit on input tree size. For larger trees, probabilities for each amino acid get very small near the root, which can lead to a heavy bias towards the fixed ancestral amino acid when GASP works back up the tree. To counter this GASP arbitrarily reduces any probabilities below a certain exclusion threshold (0.05 by default) to zero, thus reducing the slow accumulation of very unlikely amino acids. To optimise the PAM matrices used for probability calculations, GASP uses the variable branch lengths read from the input phylogeny. There is also an option to fix the PAM distance used for all branches, which would allow the use of trees without branch lengths. Assignment of ancestral amino acids with the GASP algorithm is achieved by combining data from the descendants of a given node n and its direct ancestor n0. This ancestor itself is heavily influenced by the descendants of n but also by the 'outgroup' to n, namely those sequences that are descendant to n0 but not to n. The outgroup information contained by the ancestral node n0 can be vital in determining the correct sequence for n when the descendants of n are variable. For this reason, the GASP algorithm will, by default, fix ancestral sequences as it moves back 'up' the tree from the root, increasing the relative weighting of the outgroup to the two descendants. Because there is a chance of the wrong amino acid sweeping back up the tree (especially if rare amino acid probabilities are allowed to accumulate by reducing the exclusion threshold), there is an option to use amino acid probabilities from the ancestral node in the last stage of GASP rather than giving the fixed amino acid an ancestral probability of 1. This option should be used with caution. Three substitution methods were used. In the first 'PAM Equal Rates' model, the PAM1 matrix of Jones et al. 1992  was used, giving variable rates of evolution for different amino acids and different substitution likelihoods. For comparison, a purely random substitution matrix was used where every amino acid had an equal probability of evolving into every other amino acid (the 'Random Equal Rates' method). Under these methods, different residues have similar rates of evolution. A further model was used based on the PAM1 method where residues had different probabilities of evolving, before amino acid-dependent PAM effects are considered. Under this 'PAM Variable Rates' model, 40% sites evolved at the 'normal' rate, 20% half-rate, 20% double rate, and 20% almost fixed (1/50 rate). Note that the observed branch lengths remain the same as the normal 'PAM Equal Rates' method but highly variable sites will be more likely to have multiple substitutions under the 'PAM Variable Rates' method. Because one of the main advantages of GASP is its ability to deal with gaps, a second test dataset was generated from the 'PAM Equal Rates' set of trees, this time with gaps added. The addition of gaps was kept simple so that the exact same trees could be used for the gap analysis, allowing direct comparison of the results with gaps and without. (See Testing the GASP Algorithm, below.) To do this, gaps were limited to single insertion/deletion ('indel') events per column of the MSA, allowing them to overlay onto the existing simulated 'PAM Equal Rates' data. In addition, no indels occurring next to root were allowed as it is impossible to judge without an outgroup whether such an event would be an insertion or deletion. To make the gaps, each residue r of the simulated sequences was considered in turn and had a probability of 50% of containing an indel. Gaps were all of length 1 (although two gaps may fall side by side, by chance). Although unrealistic for testing multiple alignment or phylogeny reconstruction programs, such a simplification is not a problem for ancestral sequence prediction as each residue is treated independently. The short gaps meant that, for the same total number of gapped residues, there is a higher diversity in the phylogenetic positioning of the indels. Indels were placed randomly with respect to evolutionary time. Each node in the simulated data has an 'age', which is the number of rounds of potential substitution it took to complete the simulation after that node was formed. Each indel occurs at a random age T between the tip (age 0) and the oldest direct descendant node from the root. A random branch (not leading to root) is then selected for which the ancestral node is older than T and the descendant node is no older. This is the branch on which the indel occurred. The indel is randomly assigned as an insertion or deletion event with equal probability. If it is an insertion then the ancestral node plus all nodes outside the descendant clade have residue r replaced with a gap. If it is a deletion then the descendant node and all its descendants have residue r replaced with a gap. The simulated trees and alignments were run through the GASP algorithm. Because the 'real' sequence of each simulated node was known, it was then possible to determine the accuracy of GASP predictions. To test the different parts of the GASP algorithm, predictions were also made using modified GASP algorithms with parts of the model excluded. Because prediction for invariant sites is trivial for all methods, the expectation is that accuracy is inversely related to the number of variable sites. Therefore, comparisons of methods are presented as a percentage of the variable sites. In this context 'variable sites' are defined independently for each node as those sites for which not all descendant nodes (including termini) have the same sequence as the ancestral node. 'Root' = The root of the tree. 'Near Root' = A direct descendant node of the root. 'Mid Tree' = A random node approx. midway in the tree. 'Near Tip' = A direct ancestral node of a terminal sequence. To determine whether the GASP algorithm was useful its performance was compared to a crude consensus sequence at each node. Where two amino acids were present at equal frequencies in a column of the MSA, the most frequent amino acid in the total MSA was selected for the ancestral sequence. GASP may be considered crude compared to some existing Maximum Likelihood approaches and so its performance was also compared to that of both ML algorithms implemented by the CODEML program from the PAML package , namely the marginal reconstruction algorithm of Yang et al. 1995  and the joint reconstruction algorithm of Pupko et al. 2000 . In addition, the MP method implemented in the PAMP program of PAML  was also tested for comparison. 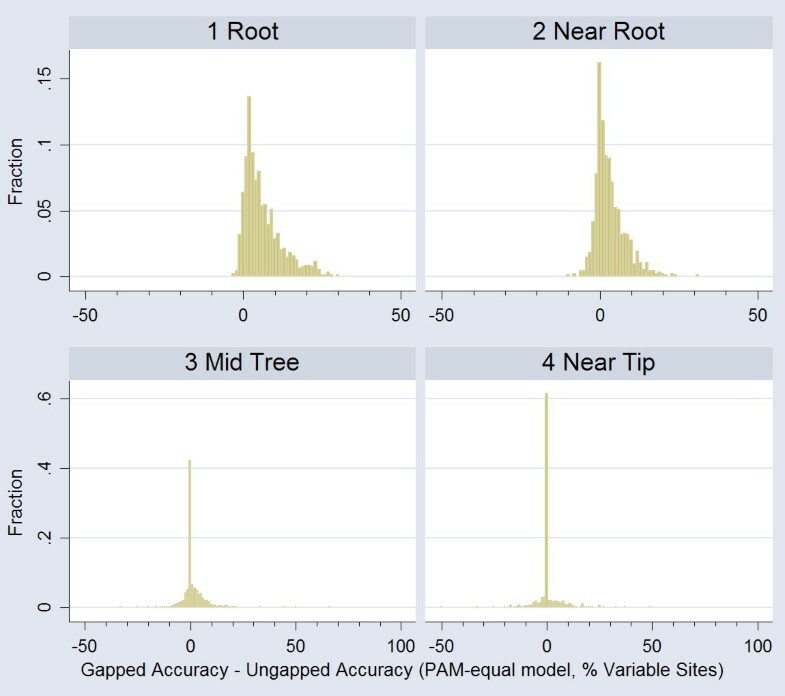 Mean accuracies of methods using the 'PAM Variable Rates' Model. Error Bars are Standard Errors. Percentage Accuracies are calculated for variable sites only (see text for details). The Percentage Accuracy for all sites is higher in all cases (Data not shown). The 'PAM Equal Rates' and 'Random Equal Rates' Models gave very similar results (Data Not Shown). Data shown includes only those phylogenies that did not crash CODEML (see text). Although the ML algorithms of Yang et al. 1995 and Pupko et al. 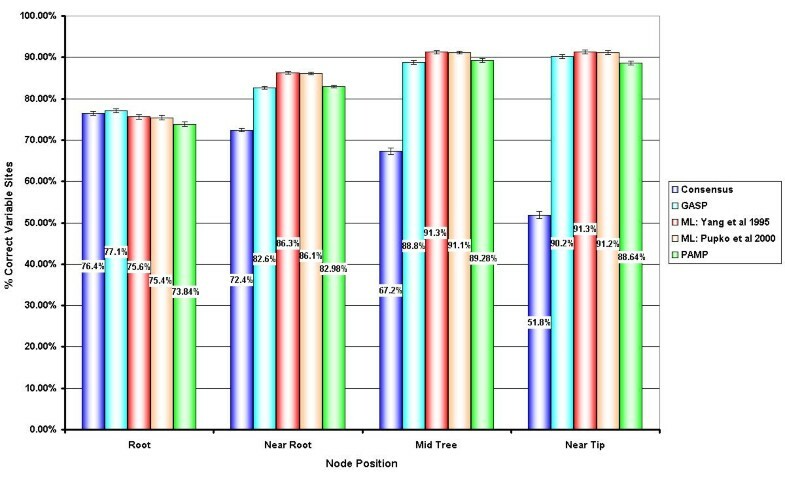 2000 performed better overall for internal nodes, this difference was not seen for every node of every tree. At each level, GASP is sometimes better and sometimes worse than all three other algorithms (Figure 3). This is also true when comparing the three other algorithms with each other (Data not shown). Difference in prediction accuracies between GASP and three alternative algorithms. (a) Yang et al. 1995 ML , (b) Pupko et al. 2000  and (c) PAMP . Percentage Accuracies are calculated for variable sites only and only those phylogenies that did not crash CODEML are shown (see text for details). Positive values indicate GASP is better than the other algorithm and negative values the reverse. Results for each tree depth are calculated separately. Values shown are for 'PAM Variable Rates' simulations only but the other evolutionary models give very similar results (Data not shown). using fixed PAM matrices rather than matrices derived from observed tree branch lengths. fixing ancestral sequences on initial pass towards root without a second pass back up the tree. no filtering of rare amino acid probabilities. using ancestral probabilities when working back up the tree rather than fixed ancestral amino acids. Elements (a) and (b) were chosen for testing because they increase computational time, while (c) and (d) may not intuitively give the best results. For the phylogenies used in these simulations, all four variants performed worse than the standard GASP algorithm (data not shown). Using a fixed PAM distance for all branches rather than approximating the PAM distance using tree branch lengths (a) gives an unfair weighting to long branches and thus increases the probability of substitutions that are, in reality, unlikely. Fixing ancestral sequences on the way 'down' the tree to the root (b) does not use any outgroup information and is therefore significantly worse at distinguishing between two or more amino acids with similar ancestral probabilities. Less intuitive is the effect of reducing low amino acid probabilities to zero (c) and using fixed ancestral sequences when recalculating amino acid probabilities using all three connected nodes (d). Indeed, excluding these two elements have a much smaller effect but still reduce the overall accuracy of the algorithm (data not shown). Using fixed amino acids when working back up the tree increases the influence of the outgroup sequence. 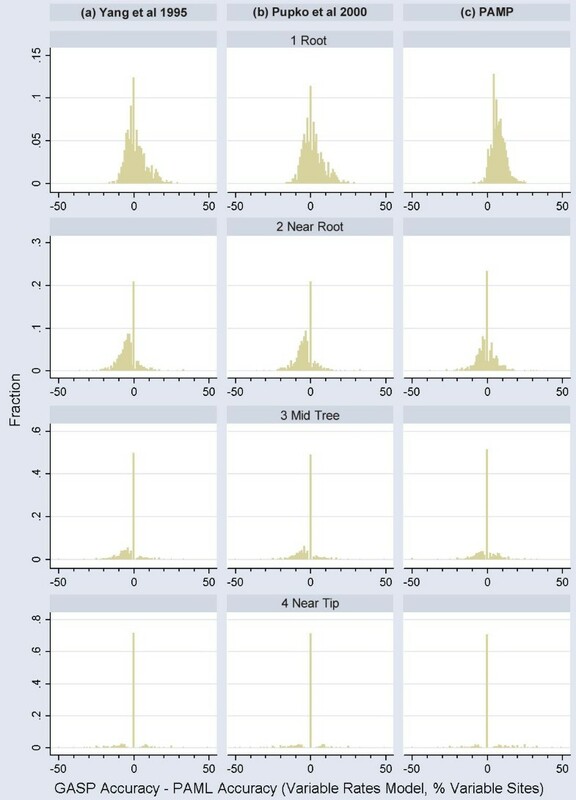 As was seen by the difference in accuracy between predictions at the root and nodes near the root (Figure 2), outgroup information is very important in predicting the correct sequence. (Predictions at the root are considerably weaker because there is no outgroup to help discriminate between alternative ancestral states.) Filtering out rare amino acids has a small effect in these trees but would be expected to have a larger effect in deeper trees. If rare probabilities are not removed then the most likely amino acid in each position will have an ever-diminishing likelihood, while highly unlikely ancestral sequences will find their probabilities ever-increasing. In very deep trees, this could result in probabilities being homogenised in the deep nodes. When fixed ancestral sequences are used to make predictions back up the tree, the fixed ancestral amino acid would potentially swamp the reduced probabilities in descendant nodes near the root, and sweep the root amino acid up the tree incorrectly. If this filtering is turned off when using larger trees, it is recommended that ancestral node probabilities be used instead of fixed ancestral sequences (i.e. combining (c) and (d)). A final test was performed to compare the use of 'real' versus 'observed' branch lengths. (This was possible because the simulations kept track of not only what changes really occurred but also how many were 'visible', i.e. not correcting for multiple substitutions.) This is not testing the GASP algorithm per se but does provide information on the importance of using an accurate phylogeny construction algorithm. (The PAML package does not require pre-defined branch lengths and is therefore only affected by errors in supplied topology and not in branch lengths.) In many cases there was no difference. However, nearer to the root, using observed branch lengths rather than the real ones decreased prediction accuracy slightly. This decrease was correlated with total tree age (data not shown). This would imply that branch lengths corrected for multiple substitutions should be used for trees fed into the GASP algorithm, particularly with deep trees containing long branches. A central part of the GASP algorithm is its ability to handle gapped alignments. As expected, GASP correctly placed 100% of simple gaps used in this test. (Each column of the alignment has a maximum of one indel, which is descendant of the root branches.) To analyse the effect of gaps on prediction accuracy, pairwise comparisons were made between the gapped datasets and the corresponding ungapped simulations (Figure 4). As would be expected, some of the gapped data shows reduced prediction accuracy because, as with the root of the tree, there is no 'outgroup' information directly following an insertion event. In many situations, however, accuracy is increased. This is because a gap is easier to predict accurately (having only two states, present or absent) than an amino acid (which could be one of twenty). The Consensus method shows a similar pattern but with a smaller fraction of trees showing an increase in accuracy (Data not shown). Difference in GASP prediction accuracies of methods using gapped and ungapped 'PAM Equal Rates' simulations. Percentage Accuracies are calculated for variable sites only (see text for details). Positive figures indicate that accuracies for the gapped dataset are higher than for the corresponding ungapped dataset. Results for each tree depth are calculated separately. Although explicitly designed for use with protein sequence alignments and trees, it is relatively simple to convert GASP for use with nucleotide datasets. To do this, a new 'PAM matrix' should be created with substitutions probabilities for A, C, G and T only. This structure would allow the user to fit fairly complex substitution models, with different substitution probabilities for each pair of nucleotides. If the aligned sequence is coding DNA, however, it is highly recommended to use the protein sequences or a different algorithm such as those in the PAML package , as the adjusted PAM matrix would not take any consideration of codon positions. We have presented an algorithm for predicting ancestral sequences in gapped datasets. At the root of the tree, GASP marginally outperforms three existing algorithms implemented in the PAML package. For other nodes of the tree, however, the ML algorithms of CODEML [5–7] generally perform better than GASP, while PAMP  gives a similar performance. The main advantage of GASP is its ability to use gapped datasets. Simple indel patterns are accurately predicted by GASP and do not greatly decrease ancestral sequence prediction accuracy. The GASP algorithm can be reliably run on either Windows or UNIX platforms with no discernable instability. For real life datasets, as for all evolutionary studies, predictions are dependent on the quality of input alignments. Gapped residues are, by their nature, often located in regions of evolutionary instability and therefore the interpretations of predictions at such sites require extra care. In many scenarios, however, gaps are introduced into alignments by the missing termini of fragment sequences. In these situations, the complete sequences that form the rest of the alignment may be very well aligned and so it is highly desirable to have an algorithm that can process the gaps introduced by the truncated sequences. Any restrictions to use by non-academics: Author's permission required. The authors would like to thank K Johnston and S Park for helpful comments during the drafting of the manuscript. RE conceived the algorithm, coded the Perl script, designed and performed the accuracy tests and statistical analyses, designed the phylogeny simulation method, generated the simulated datasets and drafted the manuscript. DS helped in the design of test simulations and in drafting the manuscript.